Great opportunity or unnecessary risk? The topic of buying diamonds as an investment has recently become a commonly debated issue. 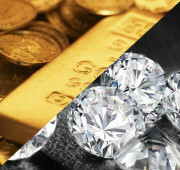 A fixed price per gram, such as the universal world price for an ounce of gold, for example, does not exist for any diamonds, whether colourless diamonds or Natural Fancy Coloured Diamonds. Each stone is unique, and no two stones are exactly the same. A diamond’s value is determined by several factors, the best known being the 4Cs: Carat, Colour, Clarity and Cut. Even the smallest differences can have an enormous impact on price. The term “investment diamonds” is used more and more often; however, because diamonds yield neither interest nor dividends, they are not a typical investment. Supply and demand also affect the price of diamonds, so although diamond prices are stable over a long period, a drop in demand can cause prices to fall. For rare colours like pink, blue, green or red, prices have increased significantly for stones of all sizes. In recent years, record-breaking prices have been paid for larger stones in these colours at the famous Sotheby’s and Christie’s auctions. Despite these record prices, however, caution is still advised because often times, those high prices were paid by professional traders who specialize in the sale of such stones. In addition, several “important” stones recently failed to attract buyers at auction. Other suitable options for investment include diamonds in less rare colours that come from mines which are expected to close soon. The Argyle Mine in Western Australia is a perfect example. Although top prices are already being paid for pink diamonds from this mine, champagne coloured stones from Australia are still relatively inexpensive compared to other colours. Nevertheless, prices for champagne diamonds have also increased in recent years. If this mine, currently the world’s largest supplier of champagne coloured diamonds, does indeed close as expected, the prices for beautiful single stones in these colours will continue to rise. Despite price increases for individual diamond colours, it is still difficult for end customers to make a profit with diamonds. End customers pay retail prices to the jeweller. If they want to then sell the stone, they will only receive the wholesale price back from the jeweller. In addition, the customer will not be able to reclaim the sales tax paid on the retail price. In order to make a profit, the stone’s value would need to have risen sharply, and that is usually only the case over a very long period of time. Otherwise, the jeweller would have to forgo his profit margin, making the sale of diamonds unprofitable. To complicate matters further, there is no real resale market for diamonds. Unlike gold, diamonds cannot just be sold at the nearest bank. It is sometimes very difficult to find a suitable buyer, and almost impossible to find one quickly. For the reasons mentioned above, we at KULSEN & HENNIG and DOMINIK KULSEN are very critical of using “diamonds as an investment”. Diamonds are a luxury item and we feel strongly that they should continue to be used primarily for jewellery that defines itself through emotion, design, and the pleasure that comes from owning and wearing the stones. Jewellers and goldsmiths should consider carefully whether to engage in the sale of diamonds as an investment, as they may soon after have to deal with buying back the stones and managing the financial expectations of the end customer. This market’s opaque nature could easily jeopardize a business’s carefully built reputation. Although we cannot in good conscience recommend diamonds for investment purposes, they will, of course, always have their so-called “intrinsic value”. Their eternal beauty and elegance alone make the purchase worthwhile. First held in 1984, the annual “Argyle Pink Diamonds Tender” is an exclusive diamond sale highlighting the most exceptional stones found in the mine during the year. The 2018 Tender in October comprises 63 stones representing a total weight of 51.48 carats – a collection so rare that most of the diamonds will probably never reach the open market. A handful of specially selected collectors throughout the world will be invited to exclusive viewings in Sydney, Hong Kong and New York where they can place sealed bids on these very rare diamonds. This year’s auction is expected to break all previous records. The 2018 Argyle Pink Diamonds Tender collection includes six “hero” diamonds, one of which (The Argyle Muse) is the largest red diamond ever offered at Tender. Bids close on October 10, and, after that, each stone will belong to the highest bidder. Rumours that the Argyle Mine will close in 2021 are already causing the prices of pink diamonds to increase. The Argyle Mine’s 2017 annual report indicated that its ore resources had fallen by 45%. No other mine in the world produces comparable stones in red, pink, violet or champagne colours. We will keep you updated on further developments! "Copyright © 2017 Argyle Diamonds Limited." golden autumn and a creative season! Looking forward to welcoming you to INHORGENTA ! You will receive our next newsletter in February 2019, right in time for INHORGENTA. Past newsletters can be found in our newsletter archives. More information is available in our Data Protection Statement.